#BirdCam: How does it work? Interestingly, the robin’s are back with a new batch of 4 eggs in the same nest. I hadn’t removed my webcam so I just needed to power everything back up to take pictures every minute. I was very surprised about this. This time I decided to host the images through Flickr. The nice thing is Flickr provides you with a private email address which you can email your pictures and they automatically appear in your Flickr photostream. As I am sending a picture every minute between 5am to 10pm, this results in over 1,000 pictures being uploaded daily to the Flickr account. I ended up needing to subscribe to a Pro account on Flickr at a cost of $25/yr which allows for unlimited uploads. This is a huge cost savings compared to trying to store, host, and serve all of those images from the website. Bandwidth on websites can add up quickly. It also gives you access to the Flickr tools and support. We will see how this experiment goes using this alternative social network. I am guessing the eggs were laid the last week of June which means hatching should occur sometime next week (around July 13th). Already there are some neat pictures being captured by the camera. 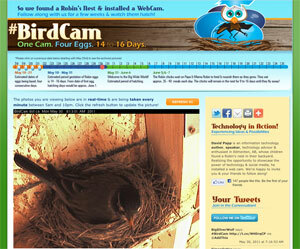 Getting this project going was a lot quicker and less work than the original BirdCam website. Making use of the social networking tools that are at our disposal, many of them free, is the way to share this with everyone. We will still look at putting together some time lapsed & live videos to YouTube along with Facebook posts. The #BirdCam Experiment has come to an end. As you all know I was fortunate enough to spot a robin’s nest on May 22nd in our yard in a location conducive for having a webcam mounted. The eggs hatched on June 3rd and the 4 baby robin’s left on June 16th. I learned a really neat trick this past weekend using an inexpensive compact digital camera to obtain better outdoor pictures. Ever wonder why pictures taken with your camera don’t look as good when you get home as you remembered? One of the main reasons is because you were wearing sunglasses. The sunglasses act as a polarizer to reduce glare and increase the contrast you see. Colors look more vivid and the entire picture has more life. Doing this is really 1-2-3 easy. Remove your sunglasses, hold them in front of the camera lens, and take the picture! While this trick doesn’t always work, it certain can’t hurt to try this neat quick trick. Certainly for those of you who travel around with the larger SLR cameras, you likely already have a polarizer with a filter mount. If you don’t, this is something you should add to your photography arsenal. 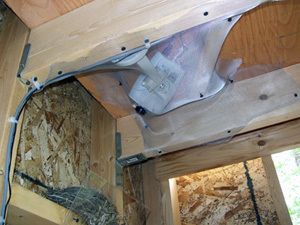 I will take you through the 5 steps to get pictures of the nest over to a public webserver on the Internet. This is where it all begins! Mother nature is generating unique content for us to try and capture the moment to enjoy. Many years ago at the beginning of this millenia, I obtained a very inexpensive webcam ($60) on eBay that I have used for a variety of applications. The model I chose was an Axis 2100 for the reason that it supported the ability to schedule taking sequential pictures (time lapse) between certain times and automatically upload these picture files to a network server. The dilemma for me was creating reliable connectivity back to our house where our Internet connection is located. Due to the heavy amount of foliage and elevation changes on our property, my preference was a “wired” solution vs a “wireless” solution. A wireless solution would have introduced issues with installing external antennas and dealing with interference and reliability. Being that a wired solution was chosen to connect back to our home network, this involved running a network cable through the bush from the shed up to the nearest building which is our garage. The total cable length of cat5 ended up being 297 feet (90.5 meters) which is very close to maximum length. 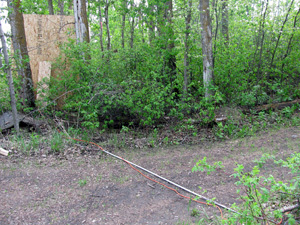 Power extension cables were also run which we use for other things in the yard. The cat5 cable was run through a loose section of conduit we had lying around to help prevent it from being crushed. The cat5 cable from the yard shed was terminated into a DLink DHP302 powerline adapter (ethernet over power). The power from our garage is a subpanel off our main house panel, therefore I was able to get a signal to work through the powerline adapters. Essentially it is like extending the ethernet cat5 cable from one location to the other, using your electrical cables that are run. It does this by using frequencies higher than the 60Hz range used by north american power. In the house near my main ethernet switch is a matching DLink DHP302 powerline adapter. 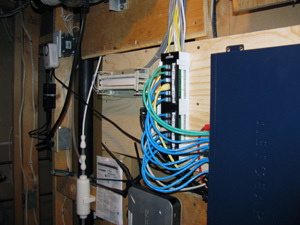 This helps provide a connection to the extended network outside (yard shed via garage) to our home network. 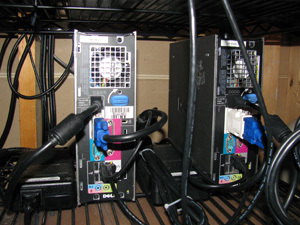 Once connected to the main home network, this allows a connection to my home server and to the Internet. My home fileserver is FreeBSD (a flavour of unix). Anything can work that supports an FTP server (where the Axis camera deposits the pictures every minute) and rsync (more on this in “The Internet”) would do the trick. You could use a Mac or Windows box as well. Note that this machines needs to be on all the time for the pictures to be “collected”. Due to the unreliability of the Internet, I decided to have images go to my home server as an intermediate instead of directly to the public webserver. I wanted to minimize the possibility of losing photos. To syncronize the directory of images between my home server and the webserver on the Internet, I used a fantastic program called “rsync”. This program allows the ability essentially “mirror” a file directory between 2 different servers. Thus only requiring to transfer any new photos that were captured by the webcam. I run this “rsync” utility every minute which helps keep things near realtime for viewing images on the public website. The idea was to keep it a light and simple website consisting of a single page. No menu or no navigation required. The images appear in a subdirectory of the website so it was very easy using a quick PHP script to always display the most recent image. The images being uploaded by the webcam are named with the date and time as part of the filename, and in a manner that is easily sortable. This is a feature of the Axis 2100 when uploading sequential images on a schedule. Everything up to this point was accomplished within a single afternoon as time was of the essence. My kids discovered the nest on Saturday, on Sunday a light bulb began to flicker in my mind’s eye, and then on holiday Monday I put in my quick implementation. Tuesday morning, back to work, I had a meeting with my staff showing them this great opportunity we have which was uber time sensitive. By mid afternoon they had created version 1.0 of the website such that it was somewhat appealing and had many of the social networking hooks. It has since been a work in progress as we receive feedback from people visiting the website. It has exploded since going live Tuesday. Wednesday evening I was contacted by several news agencies and Thursday a segment appeared for the 6 o’clock news. We are implementing new features such as picture favorites, photo archive, time lapsed videos, and much more. This has been (and continues to be as of writing this) a great experiment to incorporate nature, technology, and social media. My kids spotted a robin’s nest in our yard. It was inside one of our sheds. Hmm… a light bulb flickered to life. websites, and the power of social networking. 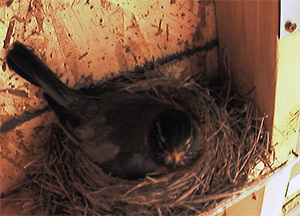 Within a day I had a webcam mounted watching the nest and uploading pictures directly to a server. The website is still evolving with favorite pictures and viewing the photo archives coming online within a day. Why go through all this effort to do this you ask? Partially because “we can”, also because “it’s cool”, and also it is an “experiment”. We wanted to see how fast we could create a brand new website, with unique content being generated for us (thank you mother nature), how “viral” could we make it, and see where it leads. Unfortunately much of the content online these days in the social networking world is what I call “noise”. Who cares what you ate for breakfast or what you are wearing. Also many people retweet/republish/repost other people’s content. Noise noise noise. It is difficult to come by brand new unique content. Sites like what we have created have many possible applications. For instance what if we watched the construction of your brand new house being built. You could see it evolve, check on it anytime you wanted, and then a neat bonus with something being built is time lapse videos! Having a picture taken on a regular basis from a consistant location is ideal for compiling such amazing videos. We are getting recommendations from people and implementing new features as quickly as we can during this experiment. 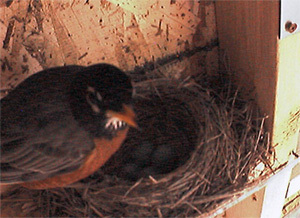 The experiment will be over in the next 3 weeks after the eggs are hatched and the new born robins all fly away. We want to see where things end up at the end of this timeframe and how viral it gets. Right now I as I write this I am enjoying watching the realtime logs on our webserver going nuts with new visitors and people refreshing their browsers. And check back frequently near June 1st which is the current best guestimate we have on when the eggs may begin hatching.